Some of them will get renovation loans that allow them to rehab a fixer-upper and make it fit for fine living, but many won’t think to include the cost of ongoing maintenance as they plan their new budgets. Like many first-time home buyers, we had a lot to learn. In addition to delving into our personal finances, we studied up on things like mortgage insurance, flood zones, and – after a particularly revealing inspection on a home we didn’t end up buying – foundation types. Ready to set up your customized home-repair budget? 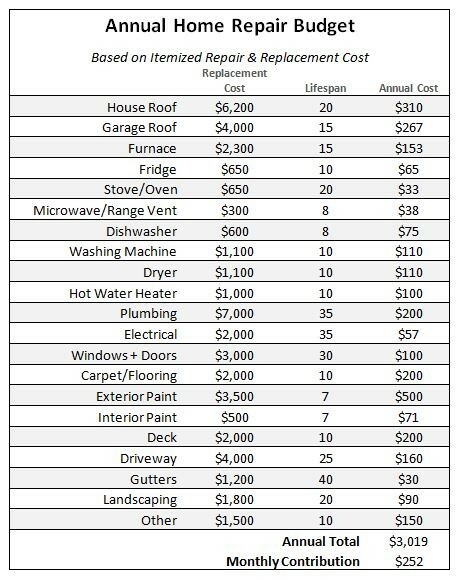 Download the Home Repair Budget Tool to estimate the costs for your home using either of these methods.